With the rising summer temperatures, keeping food safe from spoiling becomes that much more of a challenge. Nicola Monteath asks the experts to share their advice on how to make food safety a priority at home. While restaurants operate under strict food safety regulations, food at home can often fail to live up to the safety standards that are required – particularly in the unforgiving summer scenario. Even though we want to feed ourselves and our families the best, sometimes it can be easy to forget or simply not know where exactly we are going wrong. Many times, we play the blame game on restaurants or supermarkets, but rarely think back to whether the food was kept safe once in our hands. The Food Control Department at Dubai Municipality revealed at the Arab Health Congress, that the number of food-borne illnesses reported in 2013 totaled up to 1,123. This is purely due to lack of good practices and awareness on food safety habits at home. Here, Registered Dietitian at Safe Food, Safe Family (a food safety campaign in Kuwait), Dana Ghareeb, and Principal Food Studies and Surveys officer of the Food Control Department at Dubai Municipality, Bobby Krishna T M, share essential food safety tips you need to follow to protect your family’s health. “The biggest food safety violations happen from the moment people step into the grocery store. The most important aspect when it comes to grocery shopping is to ensure that shoppers follow a particular order when buying their groceries,” says Dana. If you have to buy canned, packaged foods and household items, do this first, as they aren’t at risk of getting spoilt. Fruits and vegetables, fresh and frozen meat, poultry and seafood should be placed in the cart towards the end of your shopping. “Dairy and fresh fruit and vegetables need to be refrigerated, so shoppers must ensure that these items aren’t left exposed at room temperature for more than one hour while walking around purchasing groceries,” says Dana. In the cart, make sure to avoid keeping frozen meat next to the vegetables, as the meat juices could leak onto the other foods and cause food contamination. Bobby suggests buying meat last, so that you can hold it in your hands and head straight to the checkout counter. Ensure all frozen items aren’t exposed at room temperature for more than two hours after grocery shopping, as bacteria multiplies rapidly. Also, always keep perishable food items inside your car, instead of the boot, as it is cooler. The main rules to follow are categorised under cooking, cleaning, storing and separating. Before you begin preparing your dish, make sure to wash your hands. “Always wash for at least 20 seconds before and after handling any food,” says Dana. Utensils and surfaces should be kept clean at all times. Wipe it with hot, soapy water and remember to soak sponges and dishcloths in clean water for half an hour every day. Discard any cloths that have a bad odour. Cooking: Food items must be cooked to their correct temperature, and this is why every kitchen should be equipped with a thermometer to get accurate results. When checking poultry, insert the thermometer to the thickest part of the chicken piece – it should be cooked to 74C. Whole cuts of meat and fish should have a temperature of 63C, while leftovers should be cooked to 74C. Always insert the thermometer to the most centralised part of the dish. Serve cooked food hot, and check the temperature frequently to make sure it doesn’t drop below 60C. Bacteria that causes food poisoning multiplies fastest between 5C to 60C. 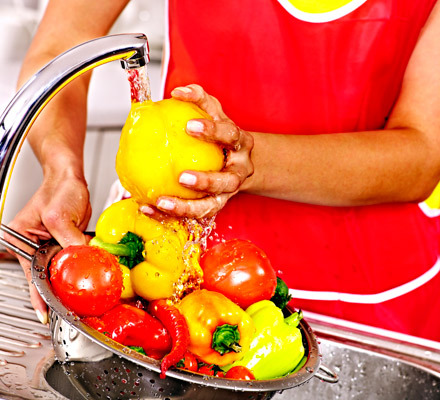 Cleaning: Before using fruits and vegetables in dishes, wash them in cold water – even those that have a peel, as bacteria sometimes transfer from the outside layer of the skin to the flesh inside. Storing: Meats and any frozen items should be kept in a freezer set to -18C, while the refrigerator should be set at 5C. It’s best to shop for groceries on a weekly basis, so that you get through all the items in the fridge, and throw away anything that looks spoilt or smells odd. Avoid defrosting food in a microwave or under running water, as food should not be frozen again when microwaved or kept at room temperature for long; Dana reccomends thawing food in the refrigerator, as it isn’t risky to re-freeze in this case. “Another common mistake a lot of people tend to make is storing eggs on the door of the refrigerator and not on the inside shelves. The constant opening and closing of the fridge door causes the temperature to fluctuate which in turn affects the freshness of the eggs,” says Dana. Separating: It’s easy to forget about separating items in the fridge, or when chopping and preparing a dish, but it is vital to remember to do so to prevent contamination. Raw meat, poultry and seafood should be kept in sealed containers or plastic bags, in the freezer. Use different chopping boards or mats for vegetables, poultry, fish and seafood. Whether you’re packing lunch for the kids or an office meal for yourself, pack it right, so that the food is safe to eat at lunchtime. Lunchboxes are exposed to various foods and become a breeding ground for bacteria. Always soak it in detergent for at least half an hour before washing thoroughly. Before adding food to the box, wrap the insides with cling film or a paper towel that can be disposed. Hot soups can be packed in a thermos to retains heat. Cold fruit and vegetables, milk, cheese and yoghurt, should be stored in an air-tight container with an ice pack. Dana recommends carrying weekday lunches in an insulated box to keep food safe and at the right temperature at all times. She also recommends packing foods like granola bars, whole raw fruits and nuts, as they keep for longer. “Pack sliced or whole fruits like oranges, apples and bananas as they are not risky options,” says Bobby. But, avoid sliced melons as bacteria grows rapidly on it, and they could be hazardous. If your children prefer food from the canteen, advise them to eat it fresh as soon as they buy it and not leave it for later on in the day. Next PostNext &RightArrow; Drink your veg!